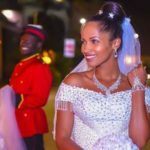 Comedian, Eric Omondi categorically tells his fans not to expect Miss Chantal to walk down the isle any time soon, if it all it will happen. On ´Word Is´ on Wednesday, Comedian, Eric Omondi articulated: Wedding is a scam. Have you not seen people who had a big wedding and separate after a week´s time? This comes in after Eric Omondi´s Instagram post, that was captioned: On the dowry part, this is his say: Caucasians don´t take dowry and that is why I did not pay her. Marriage is not papers but two human beings who come together and build a home. Marriage and dowry is a tradition for Africans only Flashback Comedian Eric Omondi and Caucasian girlfriend, met at Kasarani stadium, during Kenya´s Golden Anniversary since Independence. Eric formally went down on one knee during a Valentine´s Day gateaway. The couple has been dating since 2015 when he proposed to the model at a beach, just a year later. The post Revealed: Eric Omondi did not pay dowry for Miss Chanty and does not intend to have her walk down the isle appeared first on Ghafla! Kenya.